2013 was not my best running year. The unimpressive totals reflect a year spent in worrying about injury. I ran five Sussex Grand Prix races, the Chichester Priory 10k, the Hastings Half, the Newick Will Page 10k, and the Brighton and Crowborough 10ks. 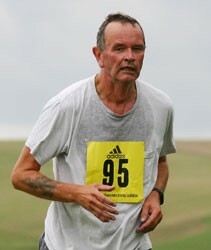 I also ran the Lewes 10k and and first ever Bill Young Memorial Run. I ran in unusual locations too, on Paxos in the Ionian Sea, and in Oxford. I completed the 2013 Janathon, but withdrew from Juneathon after an eight mile run caused my knee to flare-up. There were some large gaps: in the summer I went six weeks without running, and even when running, managed to run only twice a week, or even once. There are grounds for optimism though. At the end of the year, I seem to have started to regain strength and fitness, and am running more regularly. I now know that events like Janathon, which require daily running without a break, are beyond me as I enter my sixtieth year in February. I need time to recover. I have entries for the Eastbourne and Hastings half marathons, and am contemplating the Seaford half too. I am a quarter of the way through a training programme for Hastings, one which, unusually for me, is measured in time rather than distance. They also serve who only stand and wait, and I marshalled for races in 2013, and have the honour to be Chief Marshal for March's inaugural Lewes Marathon, the Moyleman, named in honour of the late Moyleman, a great Sussex runner.